Zibanejad and Zuccarello Give the Rangers Some Life - The Point Data-driven hockey storytelling that gets right to the point. Mika Zibanejad is on fire right now! Since January 15th, Zibanejad has 10 goals, three more goals than any other player. His chemistry with linemate, Mats Zuccarello is undeniable as Zuccarello has 10 assists in that time, tied for the most in the league. Zibanejad has points in all but one game over that time and of course that one game was the one where Zuccarello was out of the lineup. The Rangers put Zibanejad, Zuccarello, and Chris Kreider back together on January 10th and a few games later the trio started lighting it up. Kreider’s production has improved but the big change can be seen in the connection the two Z’s have made. Zuccarello’s assisted on seven of Zibanejad’s goals, 5 being primary assists. Considering Zibanejad’s 20% shooting percentage in his last eight games is more than three times higher than his career average, we can expect the goal scoring to taper off but the chemistry shown between the two Z’s is an encouraging sign as the Rangers look to re-tool and build towards the future. 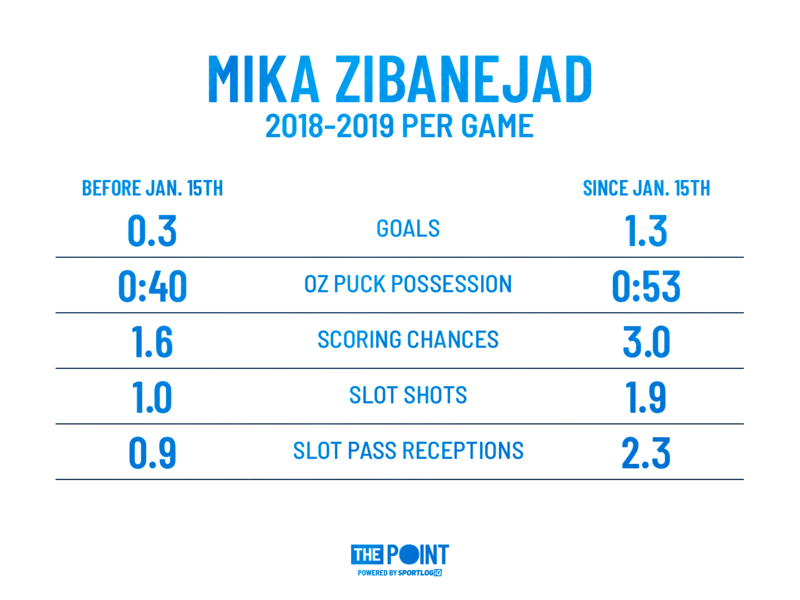 As shown in the above graphic, Zibanejad is getting to the slot at almost twice the rate he was before his goal-scoring surge. 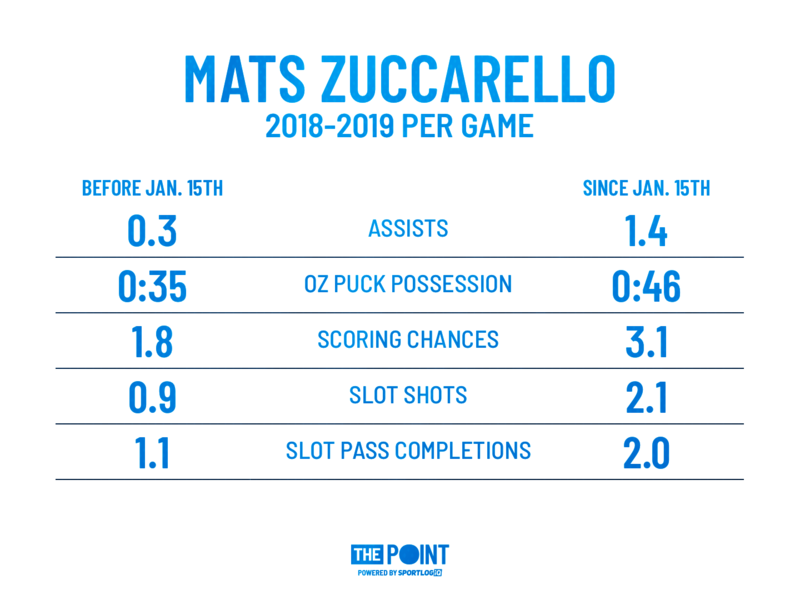 If he keeps getting to that area and Zuccarello keeps finding him there, they should continue to produce offense with regularity. Their strong play has had an effect on the Rangers as well who’ve rattled off five wins in their last eight games. It’s been a tough season for Rangers fans but right now they have the hottest duo in the league ripping it up on a nightly basis. Zibanejad is locked in at a reasonable rate of $5.35M a year for the next three seasons but Zuccarello is set to become an unrestricted free agent this July. If anything, he’s bumping his value with the trade deadline fast approaching.